CNN -- Lionel Messi is universally recognized as being one of football's greatest current players and the Argentine, who does not turn 22 until June, will have a captive world-wide audience watching his every move when he dons the famous red and blue Barcelona shirt for Wednesday's Champions League final against Manchester United. Lionel Messi has finished second in FIFA's World Player of the Year award two years in a row. Messi burst onto the world stage in 2003 when he made his debut, as a raw 16-year-old, in a friendly against Portuguese side Porto -- and since then he has become the natural heir-apparent to Argentine legend Diego Maradona. Born in Rosario, Argentina, in 1987, a year after Maradona almost single-handidly won the World Cup for his country in Mexico, Messi's talent was obvious at a very early age. He joined Argentine club Newell's Old Boys aged just eight, where he stayed until he joined Barcelona's under-14 squad in 2000. With Barcelona he has already won three league championships, two Spanish Super cups, the Copa del Rey and the Champions League. On the international stage he has won the Under-20 World Cup with Argentina in 2005, while being voted player of tournament and making his mark as the tournament's leading goalscorer. He made his debut for the senior team aged 18 and played a leading role in the side that won a gold medal at the 2008 Beijing Olympic Games. According to Forbes magazine, Messi was football's sixth-richest earner in 2008. Of his $18 million income, only a relatively small $7m came from endorsements. Maradona, now coach of the Argentine national side, has described Messi as "beautiful to watch," adding "he has something different to any other player in the world." Messi has scored eight times in this year's Champions League and is odds-on to become the competition's leading scorer -- and a winning goal in Rome on Wednesday will add the icing on the cake in what has been a superb season for both Messi and Barca. 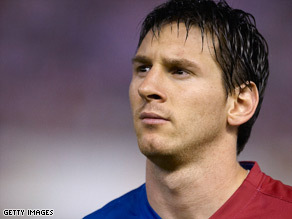 Messi's outstanding performances during the 2007/2008 season earned him second place in voting for European Footballer of the Year and FIFA World Player of the Year honors, both times being beaten by Cristiano Ronaldo. However, if he helps Barcelona add the Champions League to their La Lia and Copa del Rey crowns this season, he is likely to go one better when this year's awards are handed out.